Vietnam takes pride as one of the world’s biggest natural rubber exporter, but it still has to spend nearly $1 billion a year to import mostly synthetic rubber products to satisfy domestic production. Over the past years, the number of solar power projects has been on the rise thanks to the government’s favorable policies and increasing demand. Vietnam’s Mekong Delta province of Ben Tre is striving to attract more investment in high-tech agriculture, given that it boasts nearly 100,000 ha of coconut trees, specialty fruits and nearly 10 million ornamental plants. Electricity of Vietnam (EVN), the biggest electricity generator in the country, has complained to the government about the oversupply of coal, but at other times, the shortage of coal. Vietnam lacks an overall strategy to promote the sustainable development of domestic trade in the context of deep international integration, heard a conference held in Hanoi on December 18. The domestic cashew industry would continue to face difficulties processing and trading cashew nuts next year, according to the Viá»‡t Nam Cashew Association (Vinacas). Permanent Deputy Foreign Minister Bui Thanh Son and Under Secretary for the Holy See’s Relations with States Antoine Camilleri co-chaired the seventh meeting of the Vietnam-Vatican Joint Working Group in Hanoi on December 19. The first Airbus A321neo aircraft of Bamboo Airways, owned by property developer FLC Group, is expected to arrive in Viá»‡t Nam on January 10th, 2019. “There was hardly any road, all you could see were pineapples, pineapples, and more pineapples. We took a car, then a motorbike, and finally walked to get there,” Weng Mingzhao, board chairman of Long Jiang Industrial Park Development Company in Vietnam, recalled the time he first set foot on the park’s venue 12 years ago. National Assembly Chairwoman Nguyen Thi Kim Ngan on December 19 visited and extended Christmas greetings to Auxiliary Bishop of Ho Chi Minh City Archdiocese Do Manh Hung and local Catholic dignitaries and followers. Vietnam’s Hoang Lien Son mountain range has been listed among the world’s most exciting destinations for the year ahead, according to the acclaimed US-based National Geographic Magazine. Minister of Education and Training Phung Xuan Nha has suggested localities continuously improve the system of boarding schools for ethnic minority students. Vietnamese tourism sector held a ceremony at Ha LongInternational Cruise Port on December 19 to welcome the 15 millionth foreign visitor to the country in 2018. Vietnam’s membership of the United Nations Commission on International Trade Law (UNCITRAL) will help the country contribute to maintaining international trade law while ensuring its interests, said Deputy Foreign Minister Le Hoai Trung. Viett Nam’s rice brand logo was unveiled on Tuesday night during the opening ceremony of the third Viett Nam Rice Festival held in TÃ¢n An City in the Cá­u Long (Mekong) Delta Province of Long An. The forestry sector is playing an increasingly important role in Vietnam’s economy, according to a forestry expert. Scientists have gathered more evidence of a 14th-century Buddhism centre in an excavation at Am CÃ¡c Pagoda, TÄ©nh Gia District in the central province of Thanh HÃ³a. Streamlining the Party’s structure is a difficult, sensitive, and complex task that takes time, said Party General Secretary, President Nguyá»…n PhÃº Trá»ng. Paintings portraying the landscapes of two cities, Hanoi and Kampen, by Ha Hoang Tung are being shown in an ongoing exhibition entitled Hanoi – Hoang Ha Tung – Kampen in Kampen, Netherlands. The attention may be on Catriona Gray winning the Miss Universe 2018 but another contestant in the pageant captured the hearts of Filipinos with her Cinderella story. The third national workshop on the East Sea took place in Ha Long city in the northern province of Quang Ninh on December 19. Do Van Khanh was allegedly involved in siphoning VND4 billion ($171,541) in interest earned from the company’s account with domestic lender OceanBank from 2012 to 2014, Tuoi Tre newspaper reported. 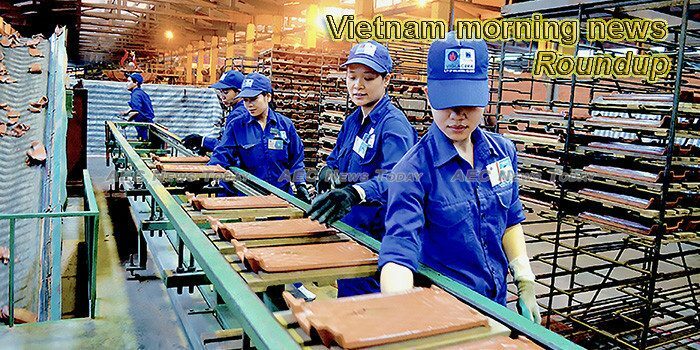 As Viá»‡t Nam heavily imported machinery and equipment from China, experts worried that Viá»‡t Nam might become a landfill of outdated technologies, urging measures to tighten the import of second-hand machinery and equipment. Online sexual exploitation of children has been increasing in Viá»‡t Nam in recent years. James Kopenec, an US citizen, has become the 15 millionth foreign tourist visiting Vietnam, as he arrived in Ha Long City, the northern province of Quang Ninh, on December 19. Mekong Beauty Show and Vietbeauty will combine to become the largest beauty trade expo in Viá»‡t Nam and will be held in August next year in HCM City.